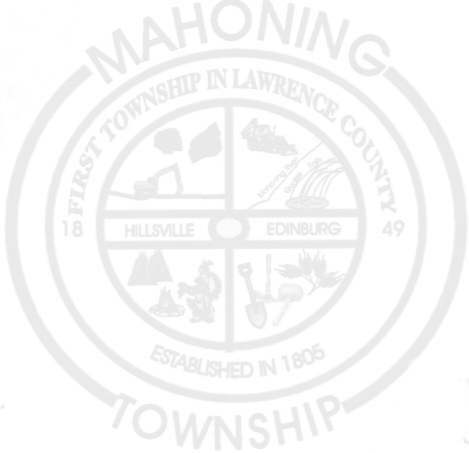 The Mahoning Township Supervisors met at the Mahoning Township Municipal Building on Tuesday, December 11, 2018 at 5:30 p.m. for their annual proposed budget meeting. The meeting was called to order by Vito Yeropoli, who asked everyone present to stand for the pledge of allegiance to the flag. ROLL CALL was taken by Jean Greco, Secretary/Treasurer. Members present were: Mark Sackin, Gary Pezzuolo, and Vito Yeropoli. Also present were Solicitor Lou Perrotta, Engineer Greg DelPrincipe, and Chief Robert Sipe. A MOTION WAS MADE TO APPROVE THE GENERAL FUND BUDGET by Yeropoli and seconded by Sackin and a vote was taken with all in favor. A MOTION WAS MADE TO APPROVE THE SEWER FUND BUDGET by Yeropoli and seconded by Pezzuolo and a vote was taken with all in favor. A MOTION WAS MADE TO APPROVE THE LIGHT FUND BUDGET by Yeropoli and seconded by Sackin and a vote was taken with all in favor. A MOTION WAS MADE TO APPROVE THE HYDRANT FUND BUDGET by Pezzuolo and seconded by Yeropoli and a vote was taken with all in favor. A MOTION WAS MADE TO APPROVE THE STATE FUND BUDGET by Sackin and seconded by Yeropoli and a vote was taken with all in favor. A motion made by Yeropoli and was seconded by Pezzuolo to adjourn. A vote taken with all in favor. The meeting was adjourned at 5:36 p.m. The Mahoning Township Supervisors met at the Mahoning Township Municipal Building for their monthly meeting which was held on Tuesday, December 11, 2018 at 6:00 p.m. Chairman, Vito Yeroploi asked everyone present to stand for the pledge of allegiance to the flag. Yeropoli asked for any guest speakers – there were none. Yeropoli made a motion to ADOPT THE MINUTES of the November 13, 2018 monthly meeting and the motion was seconded by Sackin with a vote of all in favor. Yeropoli made a motion to PAY THE BILLS as prepared by Greco since the last month’s meeting. The motion was seconded by Pezzuolo with a vote of all in favor. Yeropoli made a motion to PAY THE PAYROLLS as prepared by Greco since the last month’s meeting. The motion was seconded by Sackin with a vote of all in favor. PLANNING – Dave Rodgers reported on the DEVITO SUBDIVISION. Yeropoli made a motion to approve which was seconded by Pezzuolo with a vote of all in favor. POLICE DEPARTMENT – Chief Sipe reported for the month of November 176 incidents. He also mentioned the recent life saving act by Sgt. Brian Magliocca in which Magliocca will be awarded a Life Saving Award. Yeropoli asked for discussion for any UNFINISHED BUSINESS. There was none. Yeropoli moved onto NEW BUSINESS which was 2019 ANNUAL BUDGET WITH NO TAX INCREASE. Yeropoli made a motion to approve which was seconded by Sackin and the vote was all in favor. Yeropoli noted the next meeting will be the ANNUAL REORGANIZATIONAL MEETING to be held on Monday, January 7, 2019 at 11:00 a.m. And, the ANNUAL AUDITORS’ MEETING which will be held Wednesday, January 8, 2019 at 7:00 p.m.
Yeropoli made a motion to ADJOURN which was seconded by Sackin with a vote of all in favor. The meeting adjourned at 6:20 p.m. The Mahoning Township Supervisors met at the Mahoning Township Municipal Building for their monthly meeting which was held after its annual reorganizational meeting on Tuesday, February 12, 2019 at 6:00 p.m. Chairman, Vito Yeropoli asked everyone present to stand for the pledge of allegiance to the flag. ROLL CALL was taken by Jean Greco, Secretary. Members present were Mark Sackin, Vito Yeropoli, and Gary Pezzuolo. Township Solicitor, Engineer, and Police Chief were also present. Yeropoli asked for any guest speakers and/or concerns. There was none. Yeropoli made a motion to APPROVE THE MINUTES OF THE JANUARY 7, 2019 REORGANIZATIONAL MEETING. The motion was seconded by Sackin with a vote of all in favor. Yeropoli made a motion to APPROVE THE MINUTES OF THE JANUARY 7, 2019 MONTHLY MEETING. The motion was seconded by Sackin with a vote of all in favor. Yeropoli made a motion to APPROVE THE MINUTES OF THE JANUARY 8, 2019 ANNUAL AUDITORS’ MEETING. The motion was seconded by Sackin with a vote of all in favor. Yeropoli made a motion to PAY THE BILLS as prepared by Greco since the last month’s meeting. The motion was seconded by Sackin with a vote of all in favor. Yeropoli made a motion to PAY THE PAYROLLS as prepared by Greco since the last month’s meeting. The motion was seconded by Sackin with a vote of all in favor. Chief Sipe presented Sgt. Magliocca and Gary Pezzuolo with Life Saving awards for their actions in a recent incident involved a car that was overturned in a nearby water way. Yeropoli asked for CORRESPONDENCES in which Greco shared the Annual County Tax Outreach is scheduled for April 2, 2019 from 9:00 a.m. until Noon; and the Township’s Annual Spring Clean-up has been scheduled for March 25 thru April 6, 2019 Monday thru Saturday. 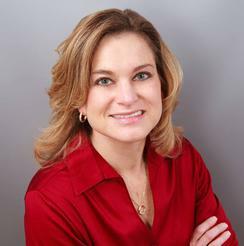 Yeropoli noted a need to change the next monthly meeting due to schedule conflicts. The date was set for Tuesday, March 5 at 9:30 a.m. Greco will advertise to meet the requirements. Yeropoli asked for discussion for any UNFINISHED BUSINESS. There was none. At 6:15 p.m., Yeropoli made a motion to ADJOURN which was seconded by Pezzuolo with a vote of all in favor. The Mahoning Township Supervisors met at the Mahoning Township Municipal Building for their monthly meeting which was held after its annual reorganizational meeting on Monday, January 7, 2018 at 11:20 a.m. Chairman, Vito Yeropoli asked everyone present to stand for the pledge of allegiance to the flag. ROLL CALL was taken by Jean Greco, Secretary. Members present were Mark Sackin and Vito Yeropoli. Supervisor Gary Pezzuolo was out of town for a family medical emergency. Township Solicitor Lou Perrotta and Police Chief Robert Sipe were also present. Yeropoli asked for any guest speakers and/or concerns. Mr. David Zarella asked to talk about concerns regarding Pensy Lane which is the road he and his neighbors access to get to their homes. Discussion ensued in which led to Mr. Yeropoli making a MOTION to obtain funding for a bridge. This motion was seconded by Sackin with a vote of all in favor. Attorney Perrotta will provide a petition to be signed by the property owners. The intent will be to get the road ordained in a similar fashion of Arena Drive. A potential grant opportunity from Lawrence County Dirt and Gravel may assist with funding on this topic. Yeropoli made a motion to APPROVE THE MINUTES OF THE DECEMBER 11, 2018 BUDGET MEETING. The motion was seconded by Sackin with a vote of all in favor. Yeropoli made a motion to APPROVE THE MINUTES OF THE DECEMBER 11, 2018 MONTHLY MEETING. The motion was seconded by Sackin with a vote of all in favor. Yeropoli made a motion to PAY THE BILLS as prepared by Greco since the last month’s meeting. The motion was seconded by Sackin with a vote of all in favor. Yeropoli introduced new items for NEW BUSINESS. Yeropoli shared and thanked the Johnson Club for a donation to fund the police department purchasing a used car to add to the fleet. Greco also announced the annual Auditor’s meeting for Tuesday, January 8, 2019 at 7:00 p.m. at the township meeting. Greco noted the next meeting would be held on Tuesday, February 12, 2019 at 6:00 p.m.
At 11:30 a.m., Yeropoli made a motion to ADJOURN which was seconded by Sackin with a vote of all in favor. The Mahoning Township Supervisors met at the Mahoning Township Municipal Building for their annual reorganizational meeting on Monday, January 7, 2018 at 11:15 a.m. Chairman, Vito Yeropoli asked everyone present to stand for the pledge of allegiance to the flag. Yeropoli appointed Greco as TEMPORARY CHAIRMAN, who asked if there were any nominations for chairman. A motion to nominate Yeropli as CHAIRMAN was made by Sackin and seconded by Yeropoli. A vote on this was Sackin - yes, and Yeropoli - yes. A motion by Sackin to nominate Pezzuolo as VICE CHAIRMAN was seconded by Yeropoli with a vote taken on this of Sackin - yes, Yeropoli – yes. A motion by Yeropoli to nominate Greco as SECRETARY/TREASURER was seconded by Sackin with a vote taken on this of Sackin - yes, Yeropoli - yes. Greco prepared the attached charts of positions, fees and pay rates along with the voting schedule to be recorded with these minutes. Yeropoli made a motion to ADJOURN and this was seconded by Sackin. The vote taken on this was Sackin - yes, Yeropoli - yes. The meeting was adjourned at 11:20 a.m.